Drinking high-quality coffee, such as Hawaiian Ka’u coffee from Hawaii’s Local Buzz, indulges all of the senses. The complex flavors on your tongue, aroma of the freshly roasted beans, and warm feeling of the mug combine to deliver a relaxing and rejuvenating experience. How do you make coffee drinking even more indulgent? Choose the right mug, and make sure you’re sipping at the right time of day. Though most people think of early morning as the best time to drink coffee, research suggests that this is not the case. Levels of cortisol, a hormone responsible for alertness, are lowest between 9:30 and 11:30 am. If you’re drinking coffee for its energizing benefits, this is the time to do it. 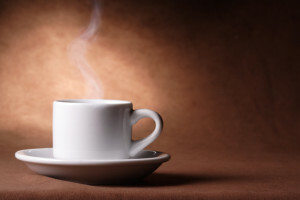 Cortisol levels also slump between 1:00 and 5:00 pm, making this a good time for a second cup. Another good time to drink coffee is right before a nap. The pleasant aroma and warmth soothes you to sleep. Over the next 20 minutes, the caffeine slowly begins to kick in, so you wake up feeling energized when your nap is over. Have you noticed that coffee tastes more bitter when sipped from a white cup? It’s not your imagination. Studies have shown this to be a real phenomenon. White mugs make coffee look darker, so your taste buds automatically focus more on the bitter tones. If you love the bitter undertones in coffee, keep drinking from a white mug. If you’d prefer a sweeter sensation, choose a clear mug instead. Visit Hawaii’s Local Buzz, and consider ordering some of our Hawaiian Ka’u coffee. Want a chance to win a gift from Hawaii’s Local Buzz? Like us on Facebook and send us a picture of your favorite coffee mug for a chance to win.